The Lumia 928 has a 26mm wide-angle lens by Carl Zeiss, a LED and a xenon flash combo and it's the third Lumia smartphone (after the 920 and 925) to feature true Optical Image Stabilization (OIS) instead of digital tricks that try (and fail most often than not) to achieve the same result. The way it works is a gyroscope detects the motion of the phone and the whole optical assembly moves in the opposite direction to cancel out the movement (e.g. hand shake. That happens 500 times a second. The Lumia 928 has that clever multi-aspect 8.7MP imager (1/3", Âµ 1.4 pixel size), which was first introduced back in the day with the Nokia N9. It snaps photos at 3264 x 2448 resolution in 4:3 mode and 3552 x 2000 in 16:9 mode (only 11% drop in resolution). 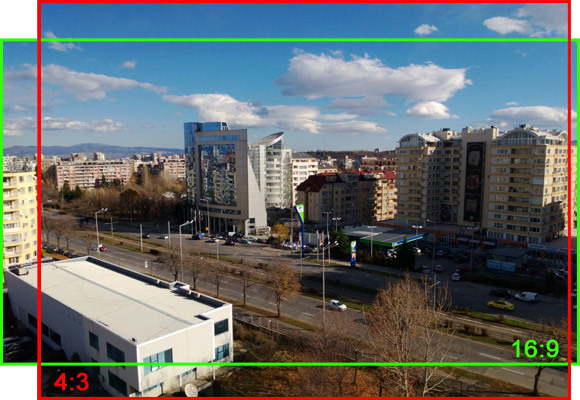 Most other cameras simply discard the info from the 4:3 sensor to make it produce a 16:9 photo and lose 25% of the resolution. In the case of the Nokia Lumia 928 not only is the loss substantially lower, but also the 16:9 and 4:3 modes have a different viewing angle (with 16:9 being wider). The shutter key will wake the phone up with a single press and launch the camera app. The Lumia 928 is not the fastest shooter around and it takes it a couple of seconds before a photo is taken. This is more delay than we're used to from modern phones. Lenses is an interesting feature, enhancing the camera functionality without making a mess of third party apps each with its own UI. Lenses are accessible directly from the native camera app (they show up in the list of installed apps too if you want to pin a Lens to the start screen). 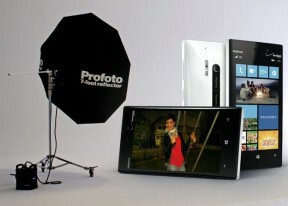 Nokia has preloaded the Smart Shoot lens, the Panorama and Cinemagraph lenses. Cinemagraph create photos that are mostly static, but a part of them is animated, it really brings them to life. You have to hold the phone steady while shooting. When you're done, the Lens will offer two (sometimes three) areas that can be animated and when you pick an area, you can tweak the animation, trim it, and set the loop pattern. This was great since you can get back to the image after the fact and correct it if you didn't get it right the first time around (we did that to reduce camera shake visible in the background). The Nokia Lumia 928 photos come out with some nice, pleasantly saturated colors. In high contrast scenes we noticed the Lumia 928 has a tendency to give priority to exposing correctly the shadows, rather than the highlights (quite the contrary to the Lumia 928, by the way). Depending on the uses, this may be either a positive or a negative thing. In our time spent with it, we liked this decision better. Thanks to the wide F2.0 aperture, the Lumia 928 photos have an impressively shallow depth of field (for a phone!) You can get a blurred background easier than on competing devices, especially on closer shots. In terms of sharpness, there is two ways to look at it. When you look at your photos in a fit-to-screen mode, they look highly detailed, which is what we guess the manufacturer has intended and optimized. But when you zoom in to 100% and you examine the actual quality from up close, the Lumia 928 seems to have several disadvantages. First of all, the noise suppression routine takes its toll on the fine detail even in bright daylight, while, sadly, still leaving plenty of noise around. The subsequent sharpening somewhat counteracts the watercolor painting look, but also makes the available noise more apparent. Nevertheless, the optical image stabilization is still a unique feature, which is enough to compensate for these downsides. Thanks to it and helped by the wide F2.0 aperture, the Lumia 928 is able to get away with really low handheld shutter speeds. These help it achieve correct exposure in low light unlike most competing smartphones, and even in the cases where the available light still allows other cameraphones to snap a correct exposure, the Lumia 928 does it at a lower ISO thus immediately scoring better with its low noise. As for the xenon flash, it left us with mixed feelings. While our impromptu flash shootout with the Samsung Galaxy S4 and its LED flash showed us that the xenon flash on the Lumia 928 is indeed superior, it turned out it's not universally better. The thing is we are not that happy with the quality of the xenon flash implementation in the Lumia 928. Indeed, in closer shots the xenon flash produced a brighter, much more evenly illuminated scene than a LED flash. But that's about it. On the negative side, the xenon flash on the Lumia 928 is still nowhere close to the performance of a point and shoot camera. Secondly, most often than not, the flash photos turned unpleasantly yellowish, obviously a case of bad white balance decision by the Lumia 928 camera. And finally, in good light there is no way you can force the xenon flash to fire, so its usefulness as a fill light in high contrast or backlit scenes is more or less absent. To sum it all up, without the OIS and xenon flash, the Lumia 928 camera is only averagely good. It's even better, if you if you are not the type to zoom in or crop out your photos. In good light most high-end 8MP smartphones are noticeably better. Come twilight though, and the Lumia 928 is able to outperform them all as you can rely on either the longer shutter speeds offered by the OIS or on the brighter, time-freezing illuminating properties of the xenon flash (if you are close enough to your subject). The Nokia Lumia 928 shoots 1080p and 720p videos (720p is the default mode). The OIS comes into play here if you're holding the phone in your hand (we doubt many people carry tripods around). The Nokia Lumia 928 videos turn out really nice. They are highly detailed, with nice colors and good sharpness. Digital noise is not an issue at all. Here is an untouched 1080p sample from the Lumia 928 you can download. Best of all, with video recording the benefits of the stabilization system are available all the time. Camera panning and general camera movement come out smooth. Thanks to the absence of camera shake the videos have a quality feel that you can rarely get from a cameraphone with a similar stabilization system. The latest iPhone 5 has a great digital stabilization but it still falls short when you are shooting while walking, something which the Lumia 928 excels at. At 20Mbps the Lumia 928 videos have plenty of video bitrate. We, however, were surprised to see that the much touted high dynamic range three-mic setup on the phone produces videos with only mono sound (and it's got a bitrate of merely 96 Kbps).